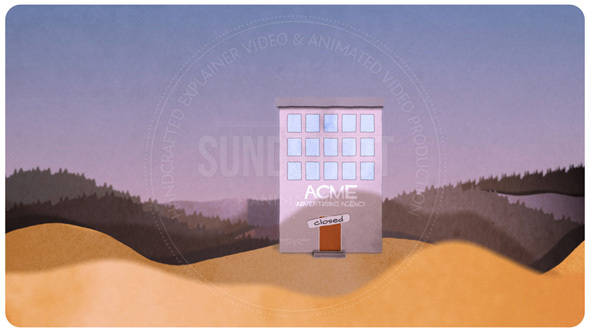 Here you’ll find answers to many frequently asked questions about our animated video services. If you can’t find answers to your questions below, please let us know. So how do I get a Handcrafted Animated Video? Simply answer a short questionnaire letting us know a little bit more details about your project, or send us a direct email. Or you can reach Anders Sundstedt right now at +44(0)7531-800-711. You can also chat LIVE in the live chat, when online (typically 8.30 am – 9 pm UK time). 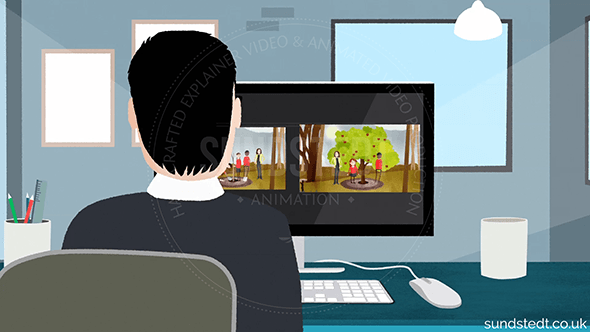 Why should we get an explainer video? How does it work? What are the stages in the process of creating an animated video? To answer this question we have described each stage in our process in this simple process page. You work directly with us and you have direct contact with the director and creative. We have the experience to work directly with clients such as directors and CEO’s. 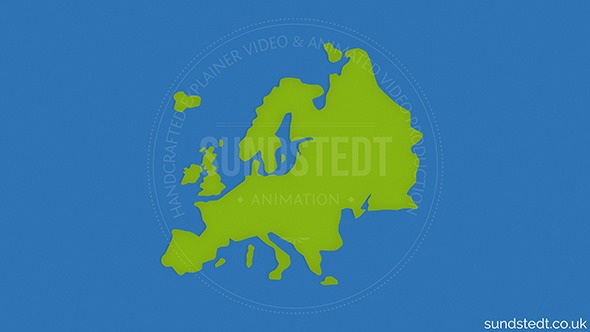 Why should I choose work with Sundstedt Animation over other providers? 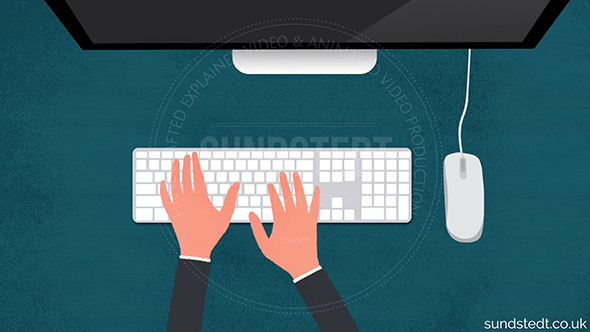 Sundstedt Animation produce great affordable animated videos to companies of all sizes. We produce handcrafted quality HD video that is modern & up to date. We make carefully crafted videos that tell stories. 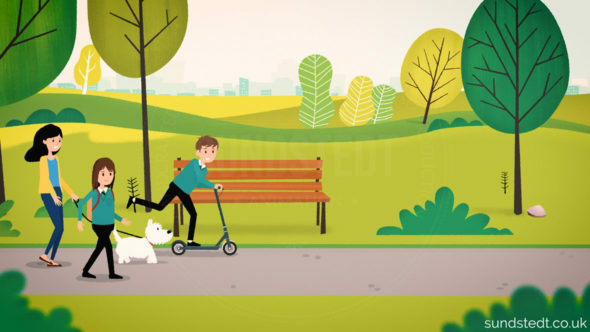 Our animated videos are fun, creative, original and imaginative in style. We are very friendly and are always looking to impress with the animated videos we produce. We offer a different, higher quality product at the lower end of the price range compared to agencies. Since we don’t outsource the project you will also have much faster response times. Director, animator and illustrator Anders Sundstedt handles your project from script to final delivery. These benefits allow you to enjoy the project more and have more fun working with us. We also work with agencies and studios, making animations and whiteboard videos for additional big brands, from Pfizer to Microsoft. Let’s go! What different types of videos do we offer? 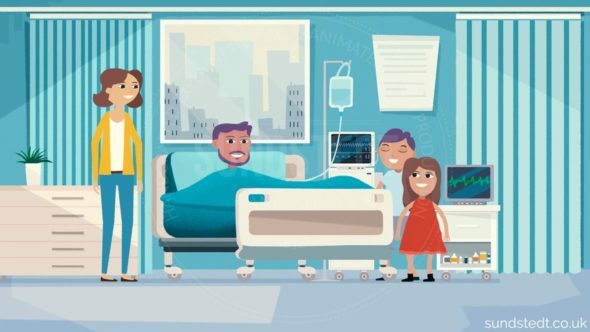 If you are looking for an online animated video, we can do pretty much anything in 2D animation and whiteboard animation. We produce different types of video content like web videos, explainer videos, demo videos, TV spots, advertising, corporate animation, educational animation, how-it-works videos, medical animation and more. We focus on techniques including 2D animation, 2.5D animation, whiteboard video and motion graphics. We are open to other techniques such as stop motion and papercraft styled animation. Whatever else you are interested in, if it’s an animated web video, we can most likely do it, so please let us know. Web videos are, on average, becoming shorter. 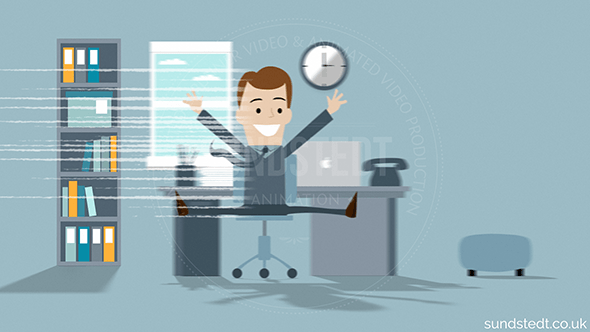 Today an explainer video between 60 seconds and 120 seconds in length is the general guidance in the animated explainer video industry. It depends on what kind of video you are producing, there is no ‘correct length’ but we try to keep our videos short (60-90 seconds) as attention spans are getting shorter and viewers want to quickly move on to the next thing (a longer video also takes longer to make). How long does it take you to complete an animated video? We have a 100% track record at delivering every project on time! On average one 60 second handcrafted high quality animated video takes us around 5 weeks from start of production to delivery. The time it takes depends on the length, visual style and complexity of the video. For example; a video that has many characters to design and illustrate, a lot of background artwork or many complex scenes could take more than 5 weeks for a one minute video, while a simpler video could take only a couple of weeks. 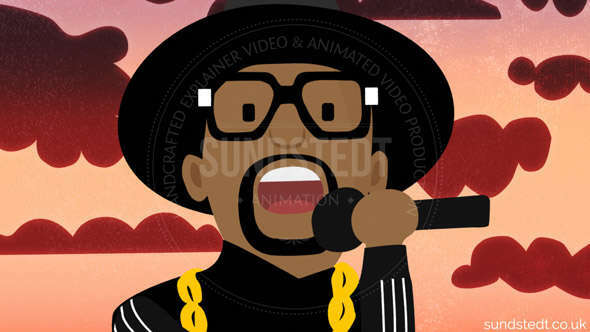 Another recent example would be a highly detailed, complex, 4 minutes long 2D animated music video, which took 3 months from the initial client script to completion. Based on the script/storyboard, the visual style and the length we can give you a very accurate estimate of delivery. If required we can offer an urgent production option at a premium rate. Let’s go! What factors are considered when it comes to the cost of the video? You always get what you pay for, in every industry! But instead of hiring an entire agency, you are working directly with Anders Sundstedt, your director, animator and illustrator. So the price is less than agencies because we don’t have as much overheads. The tailored quote depends on a few different factors: the length, complexity, visual style (for example would you prefer a 2D animated video or an animated whiteboard video) and timeframe. By providing us with project details in the contact form or email, we will get back to you within 24 hours (usually in 1-2 hours) to work our a custom free quote for you. Our services are quoted on a pre-determined project fee basis that eliminates any risk factor of you paying too much in add-ons and extra work. You know exactly what you are going to pay for the video from the start, no surprises and you will not go over the budget. For an accurate estimate, simply get in touch and tell us more about your project, using the contact form or direct email. How can I get a free quote for a similar video like the ones in your portfolio? Producing an animated video for your company is an investment that could turn out to be one of the best ones you can make! 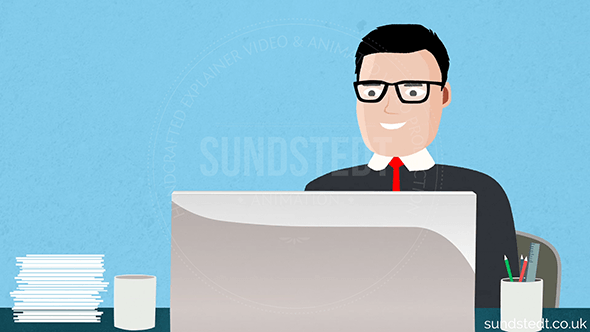 Sundstedt Animation is a sole trader business and not VAT registered, so the price in the quote or invoice is simply the actual price to be paid, no VAT will be added. Everything from design, directing, animating, compositing, editing, visual effects. You provide a script and usually a simple storyboard (very basic stick figure sketches is enough). We are very creative and come up with how to animate each scene, character animation, character design, camera movements and scene transitions. We can help you pick a matching, high quality, royalty free music track for your 100% bespoke video. If you like a custom-made music track created, please mention this in your message. Can I provide the voice-over audio? Yes, if you prefer to supply your own professional voice over. Alternatively, we can hire one of the best and most experienced voice over artists in the industry for you, to record in a professional recording studio, once the narrative and storyboard is completed. How do you typically deliver you videos? The video can be delivered as a downloadable full HD 1080p original file on Vimeo in only hours after completion. The standard video delivery format is Quicktime .MOV (.mp4 file) with the H.264 codec (Full 1080p HD resolution), optimized for web streaming. This is using the same popular file format that’s used on internet video services like Vimeo, Youtube and Netflix. The audio is 2 channels stereo, specifically with the sample rate 48 kHz. We can also quickly convert the video to 720p HD for faster playback on slower internet connections if needed, at no extra cost. We can now also offer 4K (2160p) video resolution (optional) at a premium rate. Interested in 4K? Then do remember to let us know this when asking for your free quote. We accept 50% deposit before commencing work and the remaining 50% after completion. When paid, the video is released and made available for easy embedding and simple digital download in glorious full resolution. The video can be embedded in any number of websites you wish. Another option is to order the video right now, paying up front. Our explainer videos are web videos that supplements textual information in audio-visual form. Our videos are usually short one to two minutes long, presenting information on business, products or services in a simplified way. Our custom explainer videos can be delivered in for example emails, blogs, websites, YouTube and networking sites. We provide original, high quality 1-2 minute animated marketing video, explainer video, demo videos and motion graphics that help your client understand what you do and the problems you solve. Easily present what you do, explanation via animation, boost the marketability of your products, present your case, increase the opportunity to convert traffic into business, show usability, leapfrog the competition, give an overview, engage the client in a fun and informative way, enhance your website, simplify & explain, content marketing and convert traffic to sales in a way that is fun for the client. The client fills in the form that appears under the “contact us” navigation button, or give us a call. 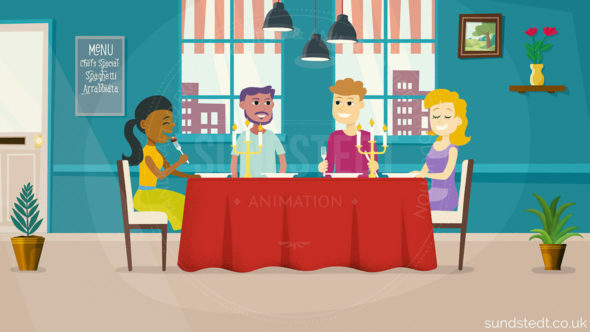 If the client wants to go ahead, we then create the animated video around the description and the requirements as stipulated in the form, client script and storyboard. For more details on the production process go here. 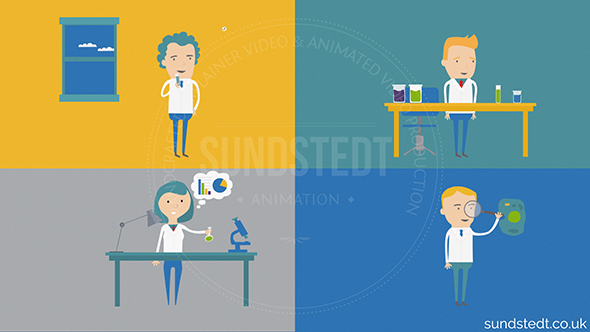 Sundstedt Animation aims to bring to market a service that enables you to engage your audience and make your concepts clear with an animated video. We love to work with fast-growing companies and startups who want to do something unique with their animated video. Copyright – Who owns the rights to the animation? The client is granted a worldwide, time-unlimited license to use the completed animation. 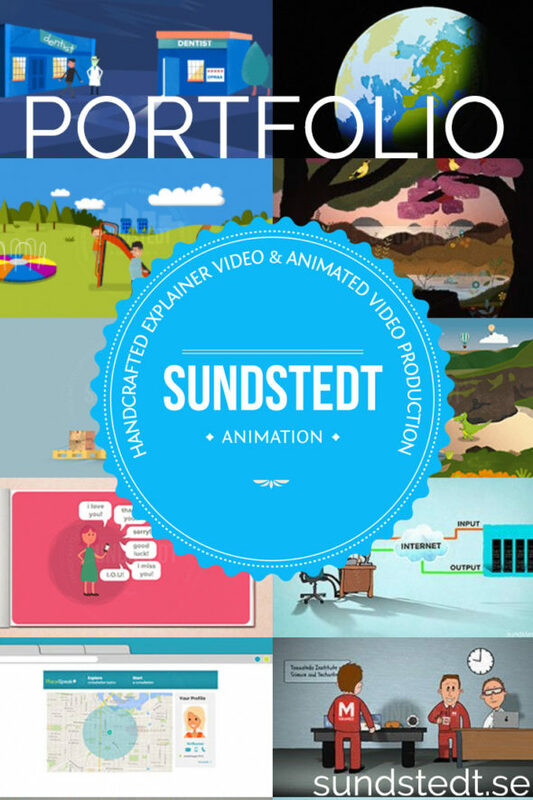 Sundstedt Animation retains the ownership, intellectual property and copyright of the final animation. Any artwork, illustrations, images, digital files and electronic project files and will be copyrighted to and remain the property of Sundstedt Animation. The full copyright details are outlined in our Terms & Conditions document. Who hosts the finished video? There are several options: You can download the video and host it yourself or upload it to your Vimeo channel, Facebook page, YouTube channel or other social media sites. If you prefer we can host it for you on Vimeo or YouTube, which means you can reach extra potential clients via our Vimeo channel, YouTube channel and website. You can embed it on your website, typically on the landing page, but you can embed it on any other page you want. Free embedding code is included for quick and easy embedding on your page. 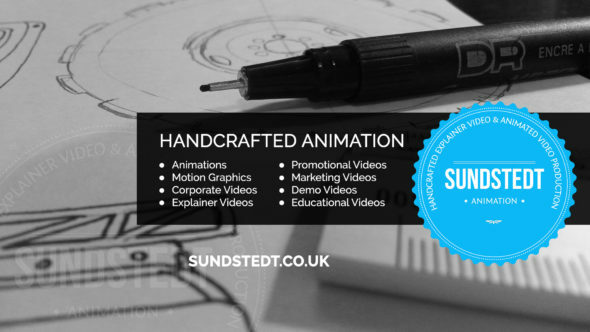 An entertaining, hand crafted, original animated video of your product, service or idea according to your requirements. An unforgettable animated explainer video production that makes your business easy to understand and helps you achieve higher conversions rates and getting you noticed. What can I do with the video once it’s finished? You can use it to pitch a new product, service, idea, start-up or media campaigns. You can use it as part of your support. You can share the video to your network and social media, LinkedIn, Twitter, Facebook, and YouTube. You can use it on your landing page, website, blog or presentation. Do you add your logo/credit at the end of the animation? No, different from many other explainer video animation studios we do NOT place our name anywhere in the video. Can I view samples and reference video projects of your past work? Yes, you can view many of our previous 2D animated video projects and whiteboard videos on our portfolio page. Will the video be unique? Yes, every design is created from scratch using no stock, templates or drag-and-drop. We take your script, we design and draw all the artwork from nothing and all animations are custom made for your video only. Because we take the time to design new character designs and new artwork for every video we make and because we do everything handcrafted, your video will be unique and 100% custom made. Do you employ people, offer work experience, internships or outsource work? Sorry, no we don’t. We don’t have the time in our busy work day or the facilities to offer a placement, hire someone, offer work experience or internships. We have no plans to hire people or to expand. We have decided that we want to remain an independent and small business, instead of being a larger studio with multiple employees. We enjoy doing all the creative work in-house including design, direction, animation and illustration, and we don’t want to manage staff. We don’t outsource work to other studios or hire freelancers, as we want all work on the website to be created in-house. Do you hire voice over artists? The short answer is no, sorry. If an animation project requires it, we will either have the client hire the voiceover artist, or we occasionally go to a voiceover artist website and listen to samples there. We get many voiceover artist applications every day, but we don’t have the time to listen to them as we are not hiring. We don’t keep a database of voiceover artist applications, so please do not send voiceover services related emails thank you. Like what you see? Let’s work together! Do you still have questions? Send us a message! Anders would love to hear from you today. Need an animated web video? For work examples of our unique, custom, fun and original animated explainer videos, ‘how does it work’ videos, educational videos, infographics videos, corporate video and music videos, check out our animation portfolio.